***You can purchase an INEXPENSIVE AD-FREE PDF of this pattern on Etsy HERE and on LoveCrochet HERE. The printable PDF with step-by-step pictures has been condensed into a total of 5 pages including the cover page! Meet Lambert, our sweet little lamb that we designed to celebrate Chinese New Year! Make one or a whole flock of fluffy sheep for yourself or your loved ones! 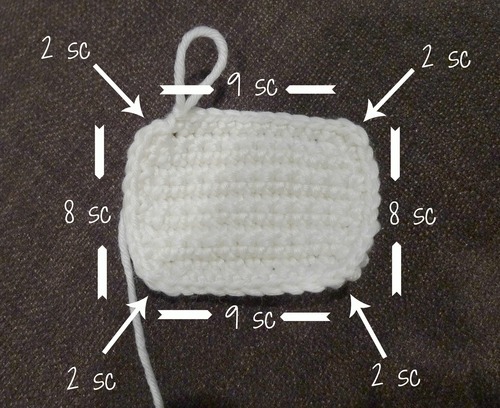 ***IMPORTANT NOTE: There is technically a “right” and “wrong” side of crochet when working in the round. Read about this in my blog post HERE. When working with the beige yarn, ensure the right side is facing outwards. When working with the white fluffy yarn, ensure the wrong side is facing outwards as this is the fluffier side (read about this HERE). R1: Starting from second chain from hook, Sc 10 . R3-8: Chain 1, turn. Sc 12. Sc 42 around edge of rectangle created, doing 2 single crochets in each of the four corners. Fasten off. R1: Sc 42 (pick up 42 sts). R2: *Sc 2, Inc*, rep 3 times. *Sc 2, Dec*, rep 8 times, Sc 1 (37 sts). R3: *Sc 2, Inc*, rep 4 times. *Sc 2, dec*, rep 6 times, Sc 1 (35 sts). R4: Sc 15, *Sc 2, Dec*, rep 5 times (30 sts). Add safety eyes- as an optional step, do technique for indented eyes as described in blog post HERE. Embroider nose in a “Y” shape using brown embroidery floss. Begin stuffing head. R2: Sc 4, *2 hdc* in next 6 sts, Sc 4 (20 sts). Sl stitch to next stitch and fasten off. Leave long end for sewing. 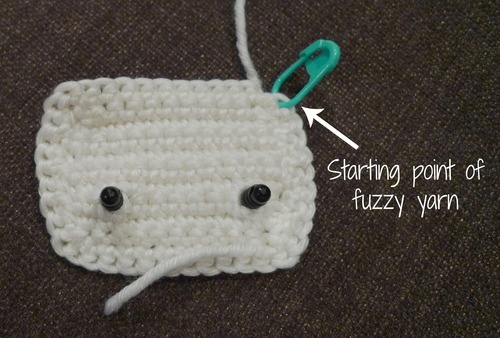 Pinch top of ears and sew together. Sew ears on sides of head. Fasten off and leave long end for sewing. Stuff and sew to head. R2: Sc 5 (5 sts). Fasten off and leave long end for sewing. Attach to bottom back of body so lamb can sit. Chain 28 or until collar wraps around sheep’s neck. Slide bell through collar. Slip stitch to first ch, finish off and weave in ends so that ends are at the back. Enjoy your sweet fluffy lambs, and have a Happy Chinese New Year! Don’t forget to check out my other amigurumi patterns in my zodiac series: Chinese New Year Doll, Dragon, Snake and Pony! And if you’re interested in a larger, more huggable lamb, see the amigurumi “Cotton” we made from the movie “Oblivion Island”! Step-by-step blog post found HERE and free pattern found HERE! 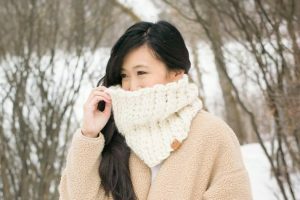 This pattern is an original pattern by Stephanie Lau of All About Ami (February 2015). Please do not claim this pattern as your own. If you wish to share this pattern, you may link to this pattern but please do not reprint it on your site. You may keep a copy for your own personal use but please DO NOT sell the pattern or distribute it.